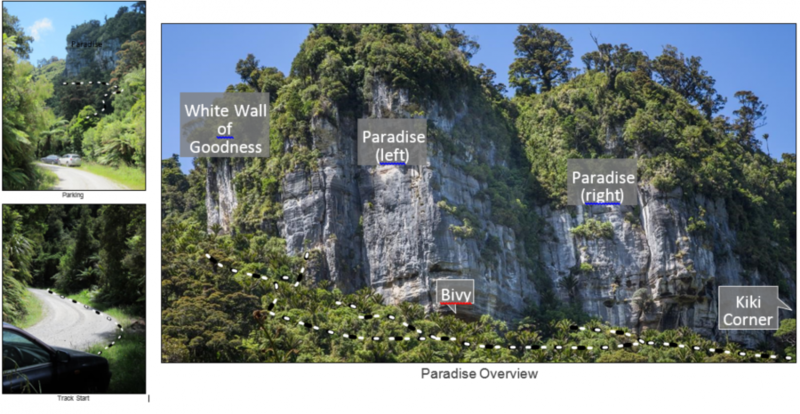 Welcome to climbing in the Paparoas, including the 'world famous' Bullock Creek and the Punakaiki River Valley. This isn't your average sport climbing destination, but it has something for everyone. North-facing limestone crags that are generally weather proof. There are quite a few good climbs here at various grades, and a lot more climbing to be developed. Development of the area began with a visit from Robin Hood back in 1985-86 when Robin and a mate put up two climbs at Hanging Gardens (Dogs in Space and a project which later became The Great Gatsby). This was the very first stage of Bullock Creek development and it ended when the river flooded and Robin was forced to swim to the wall to recover his gear. Next came a group of Greymouth climbers led by Bruce Dowrick in 1999 who put up a selection of climbs at Hanging Gardens before having a disagreement with DOC over the unsightliness of a static rope. The disagreement halted development until 2008, when Jack Grinsted fired the cannon and called in some legendary Kiwi climbers including Lindsay Main, Joe Arts and Neil Silverwood who also saw the potential shimmering in the cliff now known as the Arboretum. Over the next few years Jack and various merry men returned to put up new lines in both Bullock Creek and the Punakaiki River Valley. The winter of 2014 saw a heap of development from Neil Silverwood and Neil Warrington who put up nearly two dozen new pitches. As of January 2015 Bullock Creek has undergone its biggest development phase to date with funding graciously provided by a Sport New Zealand Hillary Expedition Grant. The team received funding to put up 30 new routes in 30 days at the newly found Paradise Crag and its outlying walls, with the help of many visiting friends. Bullock Creek lies within the Paparoa National Park. Route Developers and Climbers should take care to preserve and protect the the conservation and cultural values of the area. Specific care should be taken not to disturb Gossamer Grass (Anamenthale lessonia) a 'Nationally Vulnerable' species. Also note that bivy caves may be considered culturally sensitive by Ngati Wae Wae. 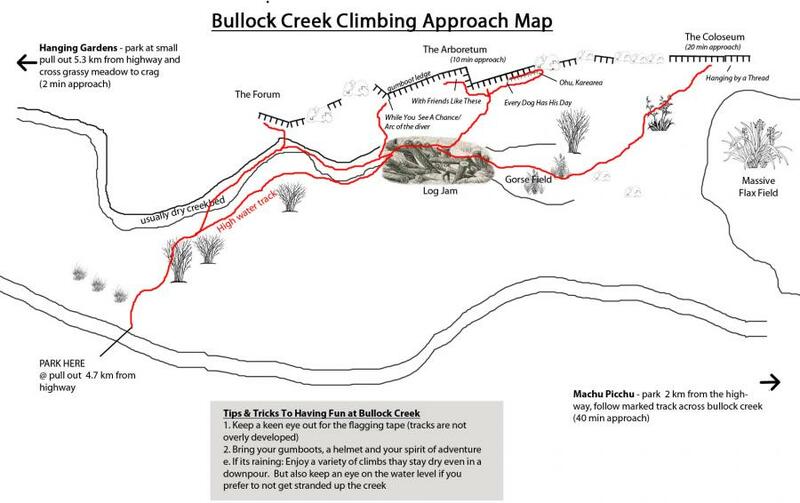 During the past few months there has been confusion and argument over whether bolting climbs at Bullock Creek is acceptable to the Department of Conservation. This issue is now over, with DOC and NZAC in agreement that the Bullock Creek area is suitable for the development of bolted climbs. The forthcoming management plan for Paparoa National Park will reflect this. About 2km north of Punakaiki, turn right (east) up Bullock Creek Road. The climbing is on the opposite side of the creek bed from the road. Drove up on Monday 7 March (in my Suzuki Swift - non 4WD), road's good, river was up too much to cross but to be honest I couldn't find any of tracks except the one to Hanging Gardens. Might we be allowed to put up a short length of ribbon at each entrance without upsetting DOC/local farmer etc.? According to the DOC area manager the road was re-opened on 25 February. The Bullock Creek Road is currently closed due to wash out. It is closed from the start of the road at the main highway. I have heard that the road is passable by high clearance vehicle or by push bike (or of course there's always walking though it is several kms) but I haven't gone up the road to double check myself. Hopefully it will be re-opened soon, until then, it's just a part of the Bullock Creek adventure.